The community of Frederickson is one of the fastest growing in all of Washington, currently with a population just shy of 19,000. The planned neighborhoods feature mostly newer homes for sale, built in the 1990's and early 2000's. Children in Frederickson attend the Bethel School District. Neighbors include Spanaway and Joint Base Lewis-McChord to the west, Summit and South Hill to the north, and Elk Plain and Graham on the southern border. 4 Beds | 2.5 Baths | 1412 sq. Ft.
3 Beds | 2.5 Baths | 2120 sq. Ft.
3 Beds | 1.75 Baths | 1494 sq. Ft.
3 Beds | 2.5 Baths | 2311 sq. Ft.
4 Beds | 2.5 Baths | 2507 sq. Ft.
3 Beds | 2 Baths | 1816 sq. Ft.
3 Beds | 2.5 Baths | 2654 sq. Ft.
2 Beds | 2.5 Baths | 1588 sq. Ft.
Blue Summit Realty has the most accurate and up to date Frederickson real estate listings on the web. Currently there are 27 homes for sale, and 5 vacant land properties in Frederickson. Of the 33 total Frederickson residential listings for sale 0 are bank owned, 0 are short sales, 0 are new construction, and 0 are townhomes. The price ranges from $170,000 to $0 with a median list price of $373,844 and median sold price of $312,017. Make sure to refine your Frederickson real estate search by property type, price, square footage, bedrooms, bathrooms and more with the search tool above or view the Frederickson listings on our interactive map. 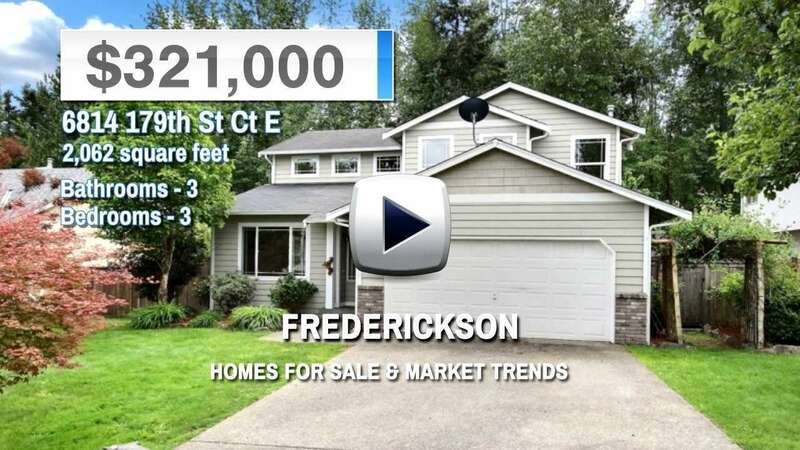 Our Frederickson real estate listings were updated 26 minutes ago.